Whether I’m traveling for business or pleasure, I look for ways to relax and enjoy my time in the air, which typically involves enjoying a cold craft beer and a snack. Lucky for me, Alaska Airlines’ beer menu offers nothing but craft beer. The company’s rotating West Coast brews – along with a new line of feel-good retail snacks – pleases a variety of palates with a range of choices. When considering beer and snack options, I approach my decisions the same way whether on the ground or in the air. I peruse the beer menu, make my decision and then look for a snack to accompany the flavor attributes of my beer. As I whiz across the sky at cruising altitude, I want to feel like I’m relaxing at the local pub. New on the menu this week, Lush IPA (80 IBUs) from Seattle’s Fremont Brewing offers a true, authentic taste of the Northwest, which is to say it’s a hop-lovers dream. Brewed with hops from the Yakima Valley, the nation’s most productive hop-growing region, this beer has earned the adoration of beer fans in the Puget Sound region and was named Best IPA in Seattle Magazine’s 2018 Best of Beer Awards. “Lush IPA celebrates the ingenuity of the Northwest’s hop farmers. It features new-school tropical hop flavors with classic, piney hop flavors for a rich, lush sensory experience,” he continues. According to Matt, the beer’s soft, well-rounded melon notes pair well with a wide variety of foods. 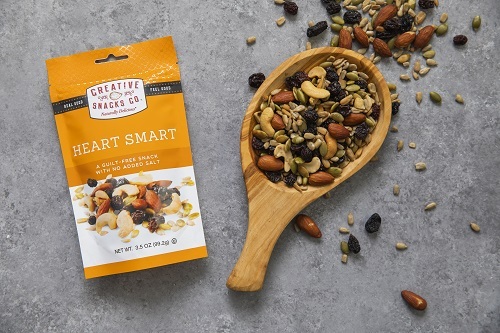 Try it alongside the all-natural, GMO-free Creative Snacks Trail Mix and notice how the fruity character of the beer is accentuated by the cranberry and other fruit flavors in the snack. I love a hoppy IPA, but sometimes I crave a light and refreshing beer, like the Kölsch (18 IBUs) from Alaskan Brewing Company, another of the current beer selections on the menu. This Alaskan rendition of a German classic beer style is brewed with glacier-fed water at the company’s facility in Juneau, Alaska. This bright, crisp and refreshing beer is designed to please just about every palate and fits into an active lifestyle. 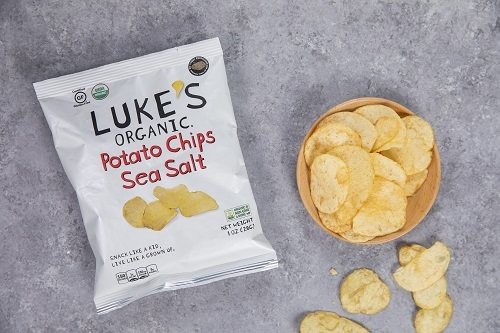 Sip this one while you enjoy a bag of Luke’s Organic Potato Chips, noticing how the sea salt helps enliven the beer’s soft, cracker-like flavors. “Because of its mild, easy-drinking character, this beer pairs well with just about any food; it accompanies all, but overpowers none,” says Andy Kline, communications manager at Alaskan Brewing. If you’re looking for a beer with a little bit more body, but is still light and crisp, consider the 805 Blonde Ale (20 IBUs) from Firestone Walker Brewing of Paso Robles, California. 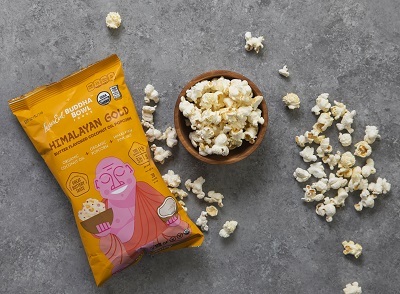 Subtle, sweet malt flavors balance with just a tiny touch of hop bitterness to makes this beer a great companion for the Himalayan Gold Popcorn’s vegan, dairy-free butter flavoring. Firestone Walker Brewing says they created 805 Blonde Ale for the laid-back California lifestyle, but in recent years it has gained wider popularity up and down the West Coast. Speaking of a laid-back approach to life, the folks at Lagunitas Brewing in Petaluma, California have mastered the art. The brewery’s quirky, fun-loving attitude is expressed in its creative, always-tasty beers. The brewery’s 12th of Never Pale Ale (45 IBUs) is an exercise in balance, combining the yin of the hops with the yang of the malt. It is light, yet full bodied. It is not quite as hop-forward as an IPA, but 12th of Never Pale Ale still packs plenty of aromatic, tropical hop flavor, which is counterbalanced by the grains. The recipe includes some puffed wheat, which lends the beer a silky-smooth mouthfeel and helps it go down smooth and easy. 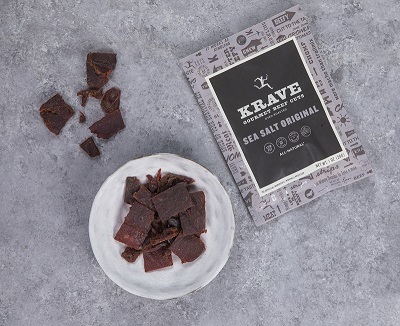 Still, it is robust enough to stand up to the rich flavors of the all-natural Krave Gourmet Beef Cuts. And for that sweet tooth? 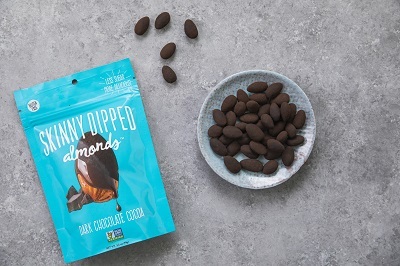 Alaska has you covered with Skinny Dipped Dark Chocolate Almonds. From a super-hopped IPA to a crisp and mild Kölsch, with a Blonde Ale and a Pale Ale that sit right between those two extremes, Alaska Airlines’ beer selection has something for everyone. Have a beer and a snack, relax and enjoy some time at cruising altitude in your flying pub. 22 comments on "A West Coast pub at cruising altitude"
While I am certainly a fan of the craft brews, I was sad to learn from an FA on my most recent flight that along with these changes, we are also losing the route-specific specialty options (Hawaii, Mexico, Costa Rica). I, for one, am very sad to see those go–especially the Kona Longboard, which is just insult to injury after the Mai Tai departure a while back. All these craft beers sound great to me, but ice cold would make them prefect.. Craft Beers are ok but I’d like a Coors or Budweiser. Maybe these beers can be offered in a pre-select app. Need to offer a cider, even if from a local brewery. Ciders have become very popular, and would probably be a good seller. I’m not a beer drinker but when flying in first class would love option of some La Croix or a kombucha beverage. Also, I would love to have option of the dark chocolate Skinny Dipped nuts offered in first class after the meal. Keep upping your game @alaskaair. You’re winning me over!! That’s Awesome can Alaska Air team up with Skygoody? I would love to buy my friends and family drinks and snacks when they fly with you. I cannot stand an IPA beer. Just give me a Corona or a Bud light and I am happy. What about some premium non-alcoholic beverages ? Would love it if there were a non-dairy creamer option so I could enjoy a cup of coffee on my flights. I’d love to see cold brew for purchase in-flight! you used to have those cute square cheese crackers that you discontinued and now only have the cookies. The Bischoff cookies are great in the morning, but the cheese crackers are better in the afternoon with the wine and beer. Couple problems with this new “Craft beer only” policy. Your ads all loudly state we all like a cold beer. Yes and no. Most of us DO want cold beer, but your caterers almost never put cold beer in your galleys, it is delivered warm or at room temperature. They don’t get get colder on the plane until towards the end of long flight. Second problem is that most beer drinkers want a good old top selling American light beer, like, Bud Lite, Coors Light or Miller Lite. Craft beers are a big hit with a niche of beer drinkers, and with them very popular. You need to include at least one normal Light beer choice. You know force us who loathe craft beer, if we want a drink on board, to have a cocktail. Your caterers woefully under provide ice on your planes. I only fly first class, watch this problem in action many many times a year. First class has to be “rationed” with tiny amounts of ice for our drinks, so they are luke warm for the most part. Not good at all. Thanks for letting me provide feedback. Wish it were positive. Thanks for the feedback, Mark. We appreciate it. I understands that tastes differ. I, personally, “loathe” American light beer, and am not sure it’s what most beer drinkers want. IPA for me every flight. Keep ’em coming. I remember a few years back having an alaskan amber on a flight! Awesome! Saved the can!! Thnx for keeping up with the times! John g.